Want to talk theology, but the lack of sound sisters got you down? What does the Bible, the Confessions, and the history of the Church really have to say about that? 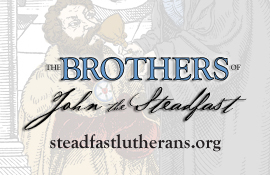 If you’ve been looking for an online home that is true to Lutheran theology and a place to connect with like-minded Christians, welcome. Our goal is to foster an environment of comfort and encouragement in confessional theology, spiritual growth, and education in the history of the church that is tailored to the needs of women. This is a wonderful website/blog. Thank you! I received an email with a blog about the Smalcald Articles, and wondered where this discussion was on this website? I would love to be in on it. Christine, welcome! Over on the left there is a group of tags, if you click on the “Smalcald Articles” one it should take you to all the posts. Let me know if you need help! I am so glad to find you all. I was about to give up. I look forward to reading the posts. I saw months ago, if not last year, on Sisters of Kathie Luther blogspace a comment where a mom was reminding the readership of a verse (a pauline epistle) that talked about the simple house/family life. Do you know where this vocation verse is located ? Thank you. Thank you for this site. Im looking forward to reading more posts and participating in discussions pertaining to the Faith. God bless. Hello ladies. I am grateful to have been referred to this site. Thank You. A friend sent me a cluster of your posts today. Each and every one of them are true gems of hope (whether you’re Lutheran or not). They made me hungry for more, so here I am at your site. Thank you for reaching out using the modern media way with such positive, uplifting messages that God is good, God is compassionate, and through Christ, God is forgiving, in spite of our short comings. We need these reminders often. God’s Word is the compass. Your posts help guide me to my Bible to read, understand further and absorb the blessings of the topic(s). A good study Bible with accompanying explanation doesn’t hurt either. Thanks! Why? I mean, I’m not in favor of adultery or anything, but one would hope that you would also rejoice over a single, childless woman whose primary commitment is to Jesus (just as a married woman’s ought to be). You have the culture backwards. If anything, within conservative evangelicalism, a woman with a husband & children might possibly be “flaunting” her gender. Sure, many (probably most) Christian women genuinely wish to get married. And according to 1 Corinthians 7:28, there is nothing sinful about getting married. But insofar as a having a husband & kids is seen as the calling card for godly, feminine respectability within the church, then marriage & motherhood can actually become idolatrous status symbols within these types of communities. Folks, this is churchianity, not the New Testament.